The strength of a Formicidae seen at La Selva Biological Station, Heredia, Costa Rica. Photo by Geoff Gallice. Used under the Creative Commons Attribution 2.0 Generic license. The ability to maintain persistence while encountering varying conditions can only occur by accommodating the surrounding changes. Specifically, the leaf-cutting ants, Atta sexdens, have been able to persist for many generations as they have been able to form more than one symbiotic relationship. The mutually beneficial relationship between A. sexdens and the fungi they consume is well studied. To initiate a fungal colony, an ant is required to carry an inoculate of fungus to a location near plant resources, like crops or secondary forest growth (Wirth et al. 2007). A single winged female, who produces 300 million eggs, will create worker ants to help grow tunnels and increase the colony size (Holldobler and Wilson 1990). After a year of the queen ant initially laying her eggs, the population can grow up to 1000 and then exponentially grow yearly from there (Camargo and Forti 2013). To maintain the growing population, the ants need to continuously feed their fungal gardens with plant materials. These gardens are composed of the same fungi within the colony but may or may not be the same between colonies (Holldobler and Wilson 1990). Generally, the mushroom genera Levcoagaricus or Lepiota are prominently used as the food source, but other types of fungi include Ascomycota like Auricularia, or Xyleria (Holldobler and Wilson 1990). The second symbiotic relationship discovered within these ant species is a virulent parasitic fungus, Escovopsis, that eats the attine’s fungal gardens (Currie et al. 1999). This parasitic fungus is, however, controlled by the ants’ association with an actinomycetous bacterium (Pseudonocardia), a filamentous bacterium that produces antibiotics against the viral fungus (Little and Currie 2007). A new discovery produced evidence of another symbiosis occurring on the Atta sexdens. Black yeast (Ascomycota: Phialophora) grows on the ants’ cuticles and play a role in antagonizing the ant’s mutualistic bacteria and preventing the ants from controlling the garden infection (Little and Currie 2007). The complexity in the symbiotic relationships concerning these ants and their fungal gardens has surprised many people. The Atta sexdens play a larger role for the environment and for society in South America, and although there are merits to the presence of these ants, their ability to defoliate plants and destroy crop yields means that people in South America are pressured to control these pests. Attine ants affect the environment and society in several ways. They affect the soil properties, usually in areas of secondary forest growth. Atta sexdens create cavities within the soil where the bottom portion is used as a detrital chamber to store the remains of leaves, fungi and ant carcasses (Verchot et al. 2003). They alter the nutrients available in secondary forest ecosystems by providing more nitrogen content (Verchot et al. 2003). The attines are unintentionally enriching the soil and providing macro-nutrients that are normally limiting for the plants nearby (Sternberg et al. 2007). These ants are generalists and are able to establish themselves in forest edges very well due to the plant types dominant in this area (Wirth et al. 2007). These forest edges are created by forestry practices and global forested landscapes are increasingly occurring near anthropogenic edges (Wirth et al. 2007). Deforestation and reforestation are creating secondary forest growth, thereby increasing the geographical range for leafcutting ants (Wirth et al. 2007). In fact, clearing mature forests increases the density of the Atta nests up to 30 times (Vasconcelos et al. 1995). Atta sexdens are beneficial on the micro scale, but at a larger, anthropogenic scale, there are some negative implications. If reforestation success is decreasing due to the ant’s presence, then solutions need to be attained to combat the presence of the ants. The persistence of the attines have greatly confounded humans, farmers especially, as the ants’ presence harms Eucalyptus plantations, crop yields and the aesthetics of the environment (Ferreira-Filho et al. 2015). The presence of these ants in areas near anthropogenic edges, specifically agriculture, is not beneficial for humans so methods are being construed to control or eliminate them. Humans have developed many methods to control these ants but much development still needs to occur for the results to be successful. Dry powder formulation of a mechanical insecticide, diatomaceous earth (DE), has been placed into active ant holes with the help of sulfuramid bait (Ferreira-Filho et al. 2015). The effects of DE were insignificant but the sulfuramid bait did decrease the abundance of the ants (Ferreira-Filho et al. 2015); more studies are being conducted with this sulfuramid chemical. Another method used to control the ants was by using phorid flies. In a lab study done by Bragança et al., the presence of parasitic phorid Neodohrniphora sp. significantly reduced the number of forages as well as the size of plants collected when ants were active outside of their nests (1998). The presence of other species can help control the attine’s foraging behaviour, but using these phorids in a real-life context needs to be further investigated. Temperature plays a large role in the success of the Atta nests. A study by Gils and Vanderwoude determined that the removal of canopy can cause some to relocate to an area with shade and cause others that did not move to die from the heat (2012). Another study observed post-fire effects and the success in establishing new colonies. Silva et al. found no survival of Atta sexdens rubropilosa colonies and that females did not prefer excavating burned soil from unburned soil, but a successful establishment of colonies only occurred in the areas not directly affected by the fire (2016). Using heat to control the distribution and abundance of the Atta nests appears to provide very successful results, however, applying these methods to the wild are impractical. Therefore, more research needs to be conducted to effectively and appropriately control these ant populations. 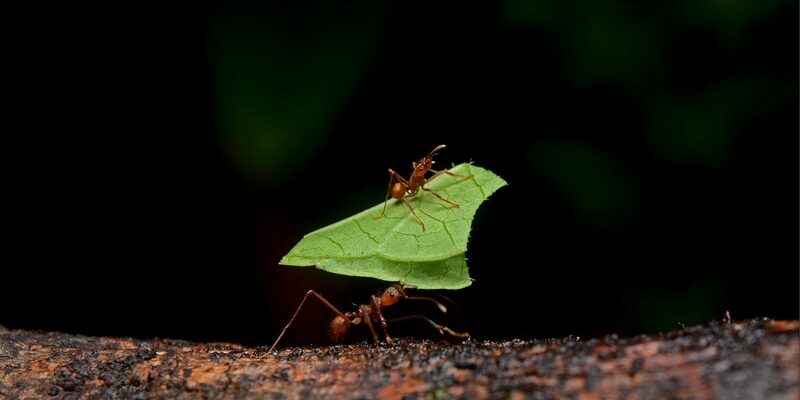 An abundance of leaf cutter ants transporting leaves. Licensed by CC BY-SA 3.0. The Atta sexdens play some beneficial roles to the ecosystem in that they cycle nutrients in the soil and increase the macronutrients available for the surrounding plants. They play some detrimental roles, too, by hindering forest successions and destroying reforestation projects due to their amazing ability to cut a large amount of secondary forest growth. These ants have invaded human-dominated regions and affected farmlands thus prompting people to develop methods to control the abundance and distribution of the Atta nests. However, many of the methods have short-term results as it only takes the survival of one female ant with an inoculum of bacterium to re-establish the population. These ants have so successfully adapted to their environment and have picked up symbiotic relationships along the way that they are able to dominate an area from their fast-growing colonies. Despite people’s efforts, the complexity of leaf-cutting ant’s behaviour and relationships have prevented them from being effectively controlled or exterminated. Perhaps testing against the Atta sexden’s reproductive abilities or inhibiting the growth of their fungal gardens may yield better results to control these resilient ants. Until then, South America will have to tolerate the presence of these ants. Bragança, M. A. L., Tonhasca, A., and Lucia, T. (1998). Reduction in the foraging activity of the leaf‐cutting ant Atta sexdens caused by the phorid Neodohrniphora sp. Entomologia Experimentalis et Applicata 89(3), 305-311. Camargo, R. D. S., and Forti, L. C. (2013). Queen lipid content and nest growth in the leaf cutting ant (Atta sexdens rubropilosa) (Hymenoptera: Formicidae). Journal of Natural History 47(1-2), 65-73. Currie, C. R., Scott, J. A., Summerbell, R. C., and Malloch, D. (1999). Fungus-growing ants use antibiotic-producing bacteria to control garden parasites. Nature 398(6729), 701-704. Ferreira-Filho, P. J., Wilcken, C. F., Neves, D. A., Pogetto, M. H., Carmo, J. B., Guerreiro, J. C., Serrao, J. E. and Zanuncio, J. C. (2015). Does diatomaceous earth control leaf-cutter ants (Hymenoptera: Formicidae) in the Eucalyptus plantations? Journal of Economic Entomology 108(3), 1124-1128. Gils, H. V., and Vanderwoude, C. (2012). Leafcutter ant (Atta sexdens) (Hymenoptera: Formicidae) nest distribution responds to canopy removal and changes in micro-climate in the southern Columbian amazon. Florida Entomologist 95(4), 914-921. Little, A. E., an Currie, C. R. (2007). Symbiotic complexity: discovery of a fifth symbiont in the attine ant–microbe symbiosis. Biology Letters 3(5), 501-504. Silva, A. D., Luiz, M. F., Jesus, F. G. D., Rocha, E. C., Oliveira, M. A. D., and Araújo, M. D. S. (2016). Post-fire effect of savannah vegetation on the establishment of new colonies of Atta sexdens rubropilosa (Hymenoptera: Formicidae). Florida Entomologist 99(4), 744-749. Sternberg, L., Pinzon, M. C., Moreira, M. Z., Moutinho, P., Rojas, E. I., and Herre, E. A. (2007). 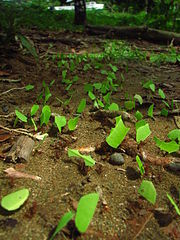 Plants use macronutrients accumulated in leaf-cutting ant nests. Proceedings of the Royal Society of London B: Biological Sciences 274(1608), 315-321. Wirth, R., Meyer, S. T., Almeida, W. R., Araújo, M. V., Barbosa, V. S., and Leal, I. R. (2007). Increasing densities of leaf-cutting ants (Atta spp.) with proximity to the edge in a Brazilian Atlantic forest. Journal of Tropical Ecology 23(04), 501-505. Vasconcelos, H. L., and Cherrett, J. M. (1995). Changes in leaf‐cutting ant populations (Formicidae: Attini) after the clearing of mature forest in Brazilian Amazonia. Studies on Neotropical Fauna and Environment 30(2), 107-113. Verchot, L. V., Moutinho, P. R., and Davidson, E. A. (2003). Leaf-cutting ant (Atta sexdens) and nutrient cycling: deep soil inorganic nitrogen stocks, mineralization, and nitrification in Eastern Amazonia. Soil Biology and Biochemistry 35(9), 1219-1222. This work by Priya Banga is licensed under a Creative Commons CC-BY Attribution 4.0 International License.